‘The Fire of Grace, staying True to This’ – is the fire of Truth, the fire of Satsang, the fire of Freedom itself. This fire has been ignited by Yantra-ji’s beloved teacher, Papaji, Sri H.W.L. Poonja. A blazing fire of Grace once ignited, that has never be extinguished. Using this book as an ongoing guide, you are invited to open to the truth of your own self, beyond any limiting illusory patterns. Through genuine Self inquiry there is a pointing to what is true, fresh, here, now – and to what is available in the willingness to stay true to this discovery. Originating from topics of inquiry held in Satsang with Yantra-ji, these messages offer insight, pose questions, and ultimately open the door to deep stillness and silence that is the truth of the Self – This that is always here, always already Free. is a collection of poetry and prose, written and gathered over the past 12 years through the offering of Satsang. My beloved teacher Papaji, his teacher Ramana, and the many other teachers who have graced my life have inspired such stillness and the grace of knowing the Truth of the Self. I am filled with gratitude in being able to offer this book to you, and am humbled by your sharing that it is a gift and blessing for you to receive it. Many of you have shared that as you open this book at any page and read the words, there is a space that opens and instantly brings you to stillness, to silence. Others have shared how they keep the book by their bedside and reflect each morning and evening, feeling pulled into the silence of Satsang. is my offering to you. don’t stir a single thought. to remember the truth of your own self. “Many people have asked to listen to the Radio Interview via the podcast so I am including it again here in this blog – please find the link above and below. Thank you to those of you who listened to the radio interview live and to those who have listened to it via the podcast. It has been such a beautiful opportunity to share with a wider audience and your feedback has been wonderful. As some of you are aware, after the passing of my teenage son in late 2012 and after returning to India in March 2013, I have been writing a series of books. During this year I also had the wonderful opportunity of being interviewed by KAren Swain of Accentuate The Positive Radio about these books. This interview was aired on Saturday 30th November 2013 on Accentuate the positive Radio with KAren Swain FM99.3. If you would like to listen to the recorded interview please click on the link below. 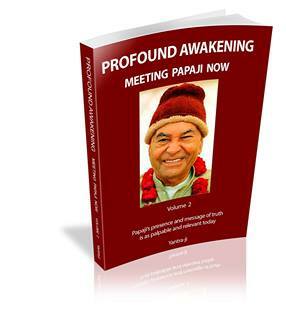 Vol 2 – is a collection of the beautiful, incredible, humbling, personal stories of Profound awakening, from people of all different backgrounds, from all around the world who have met Papaji after his physical passing. The 3rd book is about the experience of Meeting Death with the profound realisation of knowing the self, the freedom, peace and grace that is possible even in the most painful circumstances of our lives. please Click on the image.